Are you struggling to get your Art projects done on time? Some students – even those who are dedicated and hard-working – find it challenging to work at the pace required in a Visual Art course. The skilful, perfectionist student usually falls into this category; those who produce meticulous, highly-detailed observational drawings or paintings. Parents and teachers can be unsure how to provide practical, positive strategies for improvement. This article lists fifteen ways that a high school Art student can work faster, without compromising the quality of their work. There are many benefits to working on a ground. One of these is increased painting or drawing speed. A ground covers a painting or drawing surface from the outset. It can act as mid-tone, with only black and white used to apply dark and light areas (as in the examples below) or be left partially visible in the final work. This results in an artwork that is much faster to complete (see our article about painting on grounds for more information). The beautiful A Level portrait on the left has been completed upon a pale brown ground (this provides a mid-tone skin colour and is also left visible in the background). 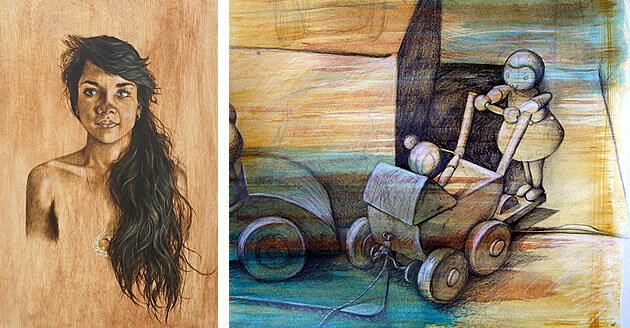 On the right, a wash of ochre, blue and brown provides a background to the drawing black and white pencil drawing. As with using a ground, patterned, decorative or textural items can cover areas of an artwork quickly. Although this strategy should be used with care, selecting only materials which support or enhance your project (usually with reference to a relevant artist model) this can be a great way to speed up your project and introduce creative use of mixed media. 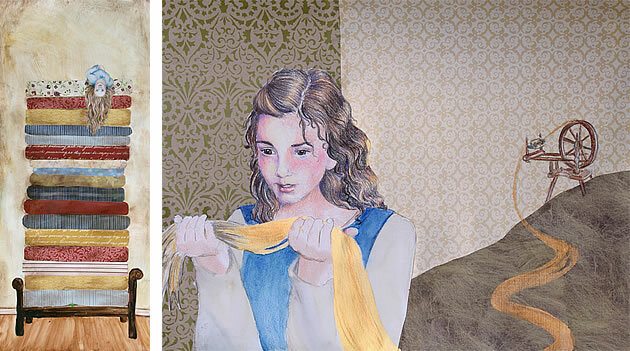 Exploring fairy tales (the ‘Princess and the Pea’ and ‘Rumpelstiltskin’, these well-composed works allow the student to demonstrate observational drawing skills in certain areas of the artwork, while saving time by covering other areas with mixed-media patterned surfaces. Artist Scott Waters produces gripping paintings on a range of found surfaces, including wallpaper, postcards and romantic paperback book covers. Note that the chosen surfaces are integral to the message in the work; the shattering of domestic bliss. 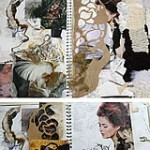 Please read this article for more exciting ideas about how to use mixed media within your work. In addition, when working on several pieces at once, ‘preciousness’ about the work tends to be lost, leading to more experimentation and greater work speed. These photos of Willem de Kooning’s studio show several works in progress pinned to the wall and scattered across the floor. Although creating a glorious working environment such as this is not possible in most high schools, many Painting classrooms have small pin board alcoves which can be used to display work in progress. 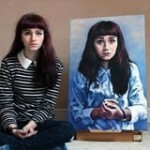 Painting things in an illogical order is surprisingly common amongst high school Art students. In almost all cases, the background should be completed first, followed by the middle-ground, ending with the foreground. This is easily understood when considering a tree in front of a cloudy sky. If you make the mistake of painting the tree first, the sky has to be meticulously painted around every leaf and branch: an irritating task that takes hours (and ends up looking a little shabby). Painting the sky first, however, means that a large brush can quickly be used to paint the sky, with the tree then easily added over the top. Painting in the correct order also results in a painting that has layers (which gives it a richness and lustre, as with using a ground). If you find that subsequent layers of paint do not adequately cover earlier ones, you have an inferior brand of paint. (We will detail our paint and art supply recommendations in an upcoming article – stay tuned)! Note: Once you understand how to build up a painting in layers, you will realise that often this involves drawing items in stages also. These vibrant, architecturally-inspired abstract works by Susan Danko are a prime example of an artwork that must be painted in a logical order. These paintings would have been exceptionally tedious had the rays of light had been painted first. Some students are concerned that it might be necessary to ‘prove’ that a straight line can be painted by hand. This is not the case. Your control of a paint brush can be ascertained immediately by looking at the remainder of your painting. Masking tape creates straight edges in seconds. Once mastered, this trick can save you hours – and make your paintings sharper, cleaner and more professional in the process. If you haven’t used masking tape before, buy some now! Enlarged details of this seascape painting can be seen to the right. All of the straight lines were created using masking tape. Artist work is sometimes purposefully ‘unfinished’. Art students shouldn’t feel obliged to ‘complete’ every item. There are many occasions when a fully rendered drawing is not necessary. Drawings, especially those in sketchbooks, can be left with edges trailing away and tone only applied to some areas. Leaving work unfinished is particularly useful when conducting visual research, exploring ideas and experimenting with media. Depending on your artist influences, this may even be appropriate in final works – as a way to draw attention to focal points and direct attention within an artwork. Note: This should not be used as justification for avoiding homework tasks set by your teacher! 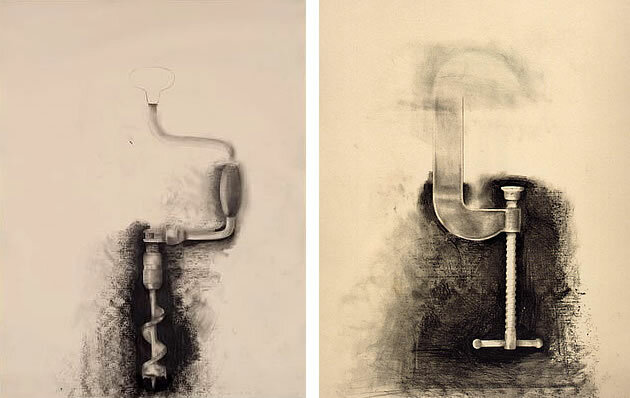 Jim Dine is an outstanding artist to use with middle and high school Art students. His charcoal tool drawings combine precise, analytical outlines (which fade away and are incomplete in places) with perfectly rendered areas and gestural, and expressive mark-making in some of the negative spaces left around the tools. Completed as part of the high school qualification AP Studio Art (2D Design) these drawings are purposefully rendered in small areas only, creating emphasis and directing vision. Deliberately picking out certain parts of a scene to draw has a strong impact on the final work and must be used with care to ensure that the resulting image supports the ideas explored in your project. As with the previous option, this allows you to demonstrate strong observational drawing skills, while saving time by omitting part of the scene. 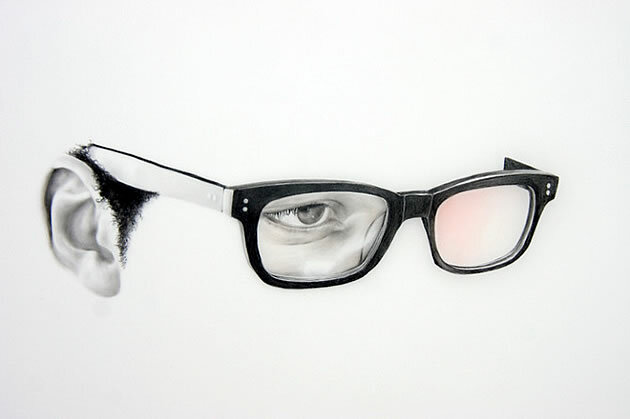 This contemporary drawing by artist Langdon Graves involves carefully selected regions of a face: well-balanced curving forms of an ear, eye and glasses. Eliminating certain areas of a scene is a dramatic measure that brings immediate focus to an artwork. 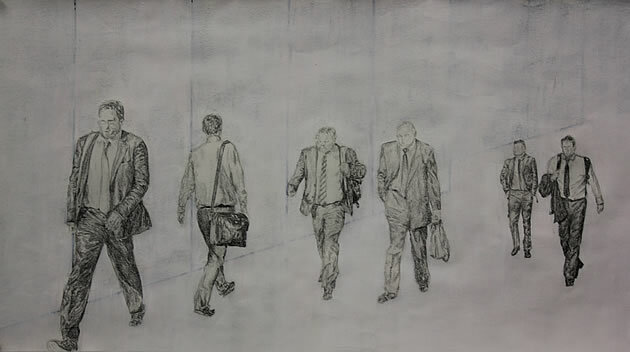 This drawing by high school student Madeleine depicts only men walking down a street – with all aspects of the surrounding obscured. This immediately suggests monotony; the daily grind; living on autopilot; and carrying out the daily routine without ever stopping to notice the world passing by. Another option that students have is to flatten tone – to remove the smooth blending gradations from dark to light. This strategy should be used with caution – and usually only in certain areas – as unintentionally flattening tone can be the hallmark of a weak student. 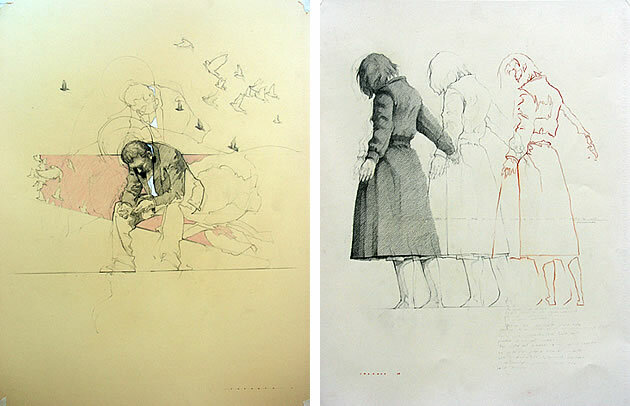 As indicated by the artist examples below, however, there are times when all or parts of the tonal variation within an artwork can be omitted with great success. 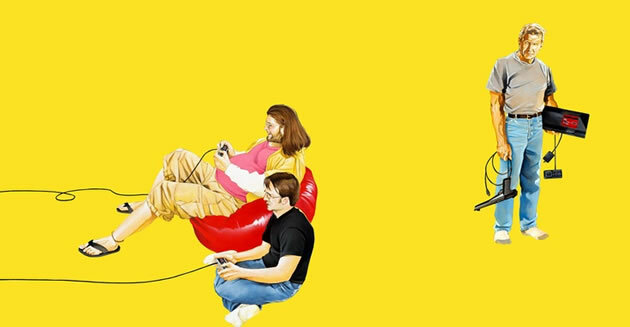 In this contemporary oil painting depicting Harrison Ford, artist Brandon Bird carefully positions three realistically rendered figures and a SEGA games system upon a wide flat area of tone (interestingly this is available in prints with different coloured backgrounds). This eliminates unnecessary clutter and swiftly focuses the attention of the viewer. 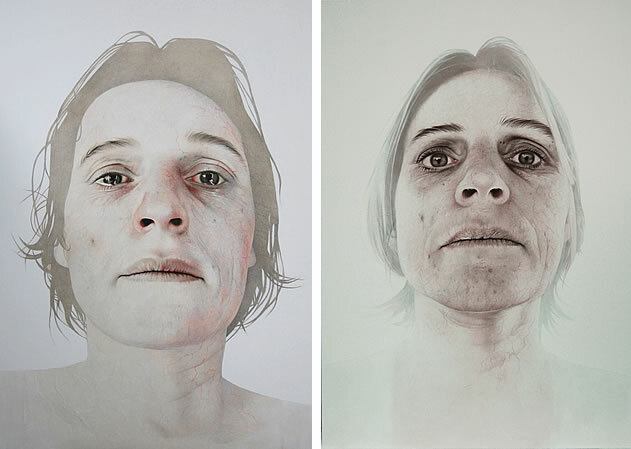 The faces in Annemarie Busschers’ self-portraits are stunningly rendered, with extreme attention given to fine details and irregularities of skin. The hair and body are pale; the hair almost completely devoid of tone. This pushes all attention to the face; the turn of the lips; the emotion in the eyes. There are many occasions where it may be appropriate for a high school student to draw using only line (it is often the application of tone that is time-consuming for students, so working exclusively with line can provide a welcome relief). Blind drawings, contour drawings, cross contour drawings and other hatched drawings (please see our collection of beautiful line drawings for ideas) can form an important part of your project. Note: It is usually necessary to demonstrate an ability to apply tone at some point to examiner, so it is not wise to exclude tone from your project altogether. This A Level Art project uses line to show complex architectural details; drawings applied over beautiful mixed media layers, which helps to create rich, visually interesting sketchbook pages. These works by artist Federico Infante contain a focus on line (in this case used to create residual after-image effects) with tone applied in certain areas only. This helps to draw the viewer in to the world of the central figure, so we share the emotion of this captured moment in time. While there is a certain quantity of painting and drawing that must take place within a Painting or Fine Art portfolio, photography can provide an excellent mechanism for moving a project forward at a faster pace. 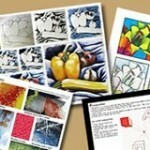 Photography can be used as a tool to develop composition, as in the beautiful AS Sketchbook pages above. Rather than ordinary snapshots of source material, the photographs here are complex digital manipulations, which help refine ideas and compositions. 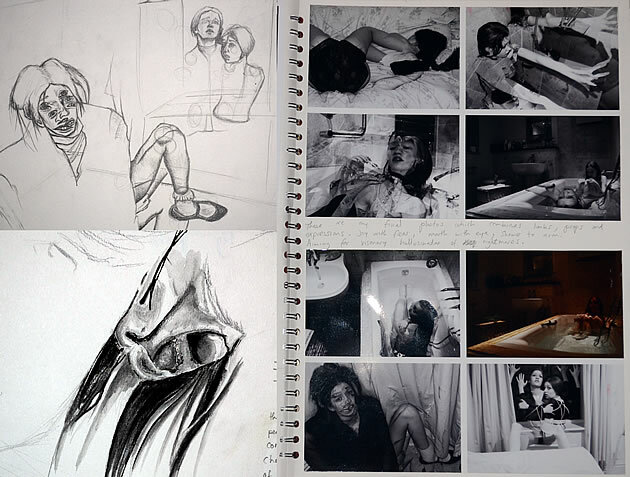 In addition to helping with composition planning, photography can be collaged into artworks or used as painting ground (but not as a mechanism for avoiding observational drawing – this is perceived by examiners as cheating). If the photograph remains visible in the final work, less paint needs to be applied, thus speeding up the art-making process. 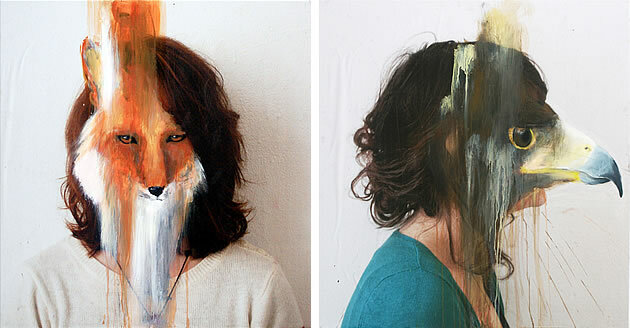 These artworks by Charlotte Caron show animal faces painted on top of photographic portraits. Note the clever unity of the colours in each image. 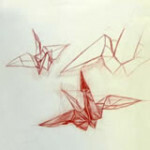 This project begins with precise, meticulous realistic drawing, moves towards impressionism and finally abstraction. 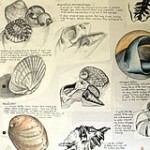 This allows a student to benefit from speed in the later stages of the work, while still having the opportunity to flaunt superb observational drawing skill. Another equally successful strategy is to incorporate realistic elements with abstract works, creating a work that is part realistic, part abstract. Excerpts from this AS Art examination show realistically depicted rotting fruit (partially complete, with edges trailing away) painted upon a rich, torn, abstract background. There is something surprisingly liberating about painting with a bigger brush – especially if you have previously worked at a microscopic scale, picking out detail the size of a pin prick. You will soon discover that it is just as easy to achieve clean edges with a larger brush and that an unexpected level of detail can be achieved. Most enjoy picking up a larger brush – even if this just becomes a way for creating grounds and applying background layers. 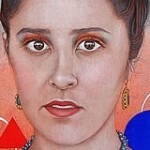 Cathleen Rehfeld paints a new painting each day and shares it on her blog. It is evident that a larger brush does not impinge upon your ability to record tone, capture lighting conditions or render form: rather, it creates refreshingly raw and soulful images: painterly snapshots in time. Instead of artwork being a laborious process that grinds away for days, images can be created quickly, using rich, expressive mark-making. 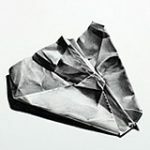 Those who have only produced realist, tightly controlled drawings usually take some time to adapt to this approach and not all students find it easy; selection of the right drawing tools and mediums can help. Charcoal, chunky 5mm wide graphite leads, Indian ink, big brushes and paint applied with pieces of card all lend themselves to gestural mark-making (please read Beyond the Brush: Inventive Mixed Media Techniques if you are looking for more ideas). Even if this style of working is not your preference and not something you wish to pursue, it can be useful to practise, particularly when planning compositions and drawing from life. 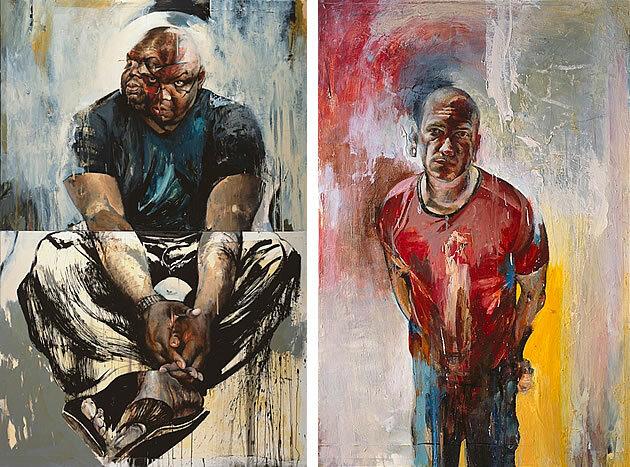 These stunning paintings by Jason Shawn Alexander have tighter, more realist faces, with surrounding areas becoming gradually more gestural and abstract. This is a superb strategy for creating focal points and creating rich, gutsy images that command attention. Even if a final work is realistic and tightly controlled, compositional sketches can be much rougher. This is an excellent method of working, when quickly testing and trialling ideas. 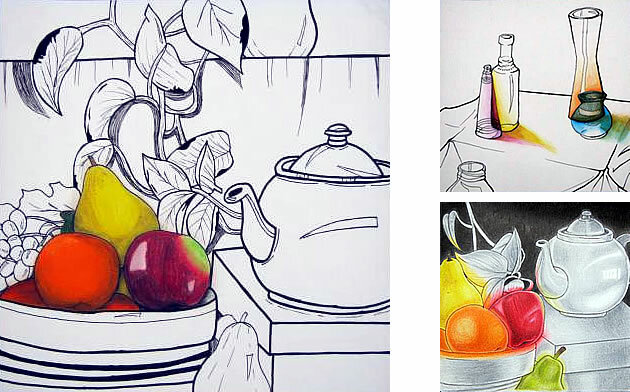 Tracing is frowned upon in most circumstances (see our article about observational drawing for more on this), however there are occasions when tracing is a valuable strategy in a high school Art project. For example, a compositional plan could be quickly enlarged on a photocopier and traced/modified as required, instead of being redrawn at a larger scale; an existing drawing could be traced or photocopied in order to trial application of a different medium or technique (this should be kept to a minimum, however, to ensure that your work doesn’t become too repetitive); repeat patterns could be traced; or different drawings could be overlaid and arranged together, tracing the composite work. You will note that the figure at the far right in the first work has been repeated in both works. A number of other time-saving strategies have also been used in the second work, such as painting on a ground, fading images away, using line only in places and incorporating abstract elements. Scanning existing artworks and editing and combining these with other artworks holds exciting promise for Painting / Fine Art students. Once a student has practised using image manipulation software (such as Adobe Fireworks or Photoshop) creating images and then printing them can be a very fast way to create amazing artworks. 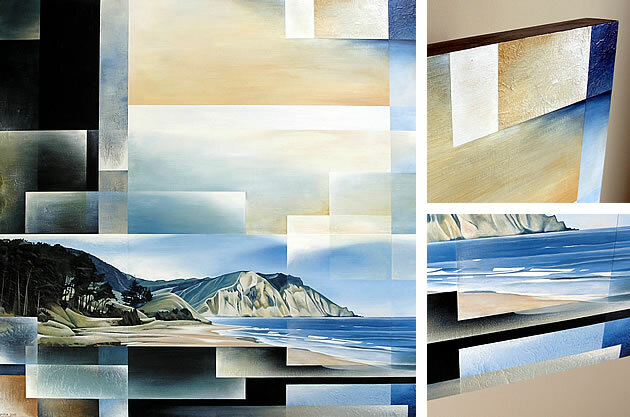 These images were created in Photoshop, using scanned images of paintings that were digitally overlaid using different transparencies, with text added. 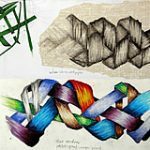 Professionally printed onto high quality paper, these works integrate seamlessly with other hand-generated works. If you found this article helpful or know others who would benefit from reading this, please share it using the social media buttons below! Note: If your problem is not speed but procrastination, you may also benefit from reading How to Stop Procrastinating and Get Your Art Homework Done.